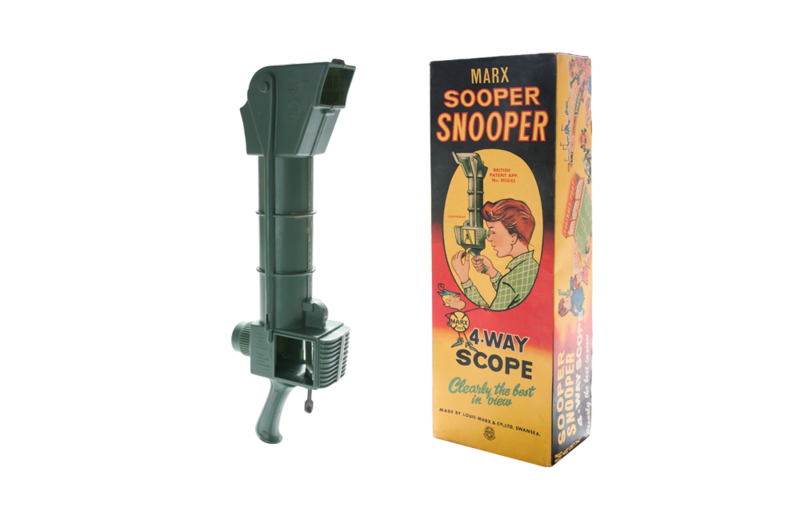 Released by Marx in 1963, the Sooper Snooper 4-Way Scope was a worthy addition to any junior secret agent’s collection of spy gear. Bearing a striking resemblance to a periscope, it allowed curious youngsters to see in four different directions – left, right, forward, and backward. Molded of high-impact plastic, the toy measured 15.5-inches tall, 3-inches wide, and 5-inches deep. Three different mirrors providing the multi-directional “snooping” capability. Two of the mirrors were hinged and could be manipulated via levers and a pulley to change the sight line. In its television and print advertising, Marx trumpeted the Sooper Snooper’s I-Spy capabilities as the equivalent of having “four extra pairs of eyes”. In addition to the original monochromatic release, Marx also sold a version of the Sooper Snooper in a camouflage pattern, and a red version for watching sporting events.